For your unusual stay in the Gironde, camping Bon Coin offers several ranges of atypical accommodation: from the tipi to the wooden cabin through a perched nest. A real small unusual campsite, the Bon Coin invites you to spend an original holiday in love, with family or friends. 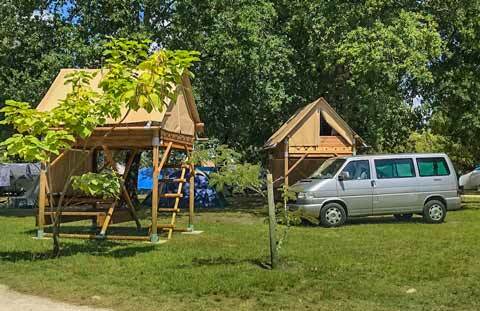 To spend an extraordinary stay in Gironde, think of unusual rentals: beautifully integrated into the surrounding landscape, our wooden accommodations have all the comforts of a mobile home with the added charm of the atypical. The lodge as the nest have their bathroom and toilet, and a kitchen area to prepare meals. The combination of wood and canvas allows you to feel closer to nature, for holidays in the great outdoors. In its structure and decoration, the lodge is inspired by the spirit of African safaris. A relaxation area with benches equips the covered terrace. In unusual accommodation, you can sleep in the shelter and in the best comfort, then make the most of the free air during the day. The Nest plays with the spirit of the perched huts: halfway between tree houses and children’s playgrounds, the structure of the Nest is composed of three platforms on stilts with tents, surmounting a space of life with kitchen, bathroom and toilet, and a shaded dining area. Very surprising, the nest is a real duplex for 6 people, both spacious and intimate. More simple but still equipped with real beds to spend restful nights, our cabins, bivouacs and teepees await the most adventurous: arranged on vast and green sites, these friendly and intimate accommodations are for couples and families with children. The cabin is the unusual accommodation without sanitary the most equipped, with two bedrooms and kitchen area. Entirely on one level, this nature accommodation with wooden structure and canvas roof is original and warm. In the same spirit, the Bivouac hosts two huts perched. Each cabin has a tent room on stilts and a sheltered space for rest and meals. Our tipis are designed in the most traditional way. Comfortable beds await you with the possibility to rent sheets. Between tent in the trees, tipis in the Indian or hut nature, choose to live your stay in the Medoc otherwise! Book now your next holiday in Gironde, near the Hourtin lake. diam ultricies Aenean ut neque. ante. leo.